Thanks to Steven Tyler and the fashion industry dry fly hackle has either become very expensive or hard to find. I have been searching for yellow grizzly dry fly hackle for some time as I use in my favourite dry fly pattern, imitating a Western Green Drake. After a long and unsuccessful search, I decided on a plan B - dying some grizzly hackle yellow. Most anglers are familiar with the Koolaid recipes (just do a Google search) when dying feathers green, blue, orange, red, purple or related colours. However, yellow is a problem and you need specialized dyes such as Veniards or RIT. 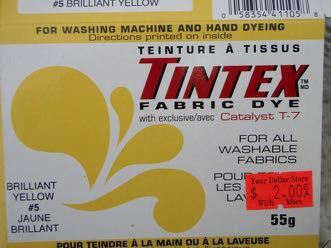 In my search for yellow dye in Prince George I discovered Tintex dye for $2 at a dollar store. For the price of a coffee it was worth a ‘good old College try’ to sacrifice a few grizzly hackles for the sake of fishing. This procedure is based on the Koolaid dying method. 1. Add ~1/2 of package Tintex dye to ~2 1/2 cups of boiling water. To keep the peace do this outside on a bbq or gas burner. 2. Stir to ensure dye is dissolved. 3. Place feathers in the dye and turn the burner down to a low simmer and incubate for 10 minutes, stir frequently. 4. Transfer feathers to white vinegar and fix the dye in the feathers for 10 minutes, shake every ~2 minutes. 5.Rinse feathers in a sealed plastic container with water for 10 minutes , shake every ~2 minutes. 6.Place feathers between two pieces of paper towel to dry. After staining, fixing and destaining, the grizzly hackle turned from white to a bright yellow. 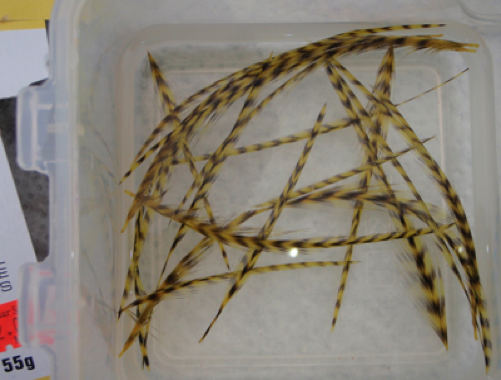 To confirm no dye was leaching, one feather was incubated in water for 12 hours at ambient temperature. I am glad to report that there was no leaching. -As a first attempt, I am very satisfied with the results; however, some may wish to optimize the procedure. -Tintex also makes many other colours and it might be worthwhile to experiment with these as well. -This started out as a plan B as I was not able to find yellow grizzly hackle. Given the results, I think plan B has become my new plan A. Now, all I need is grizzly hackle and I can dye it yellow or any other colour I need...and luckily I have a lot of grizzly hackle!